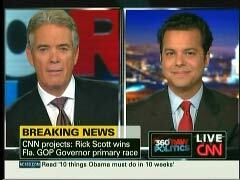 On Tuesday's AC360, CNN's John Roberts labeled Republican candidates who have Tea Party support "very far to the right," and specifically referred to Florida gubernatorial candidate Rick Scott as an "ultraconservative." Guest John Avlon also bemoaned John McCain's tack to the right during the primary campaign, and slammed how the senator has been called a "RINO" by many conservatives. Roberts, who was filling in for anchor Anderson Cooper, along with Avlon, CNN liberal contributor Roland Martin and Red State's Erick Erickson, discussed Tuesday's primary results from several states for two segments during the first half hour of the 10 pm Eastern hour. Eighteen minutes into the hour, the CNN anchor asked TheDailyBeast.com senior political columnist, "[CNN anchor] John King laid it out there, that it's going to be a challenging year, to say the least, for Democrats. Some people predicting that this will be equal to, if not worse, than 1994. What do you think?" Avlon replied that the GOP was in "reasonable striking distance" of winning control of the House of Representatives, and later added that "the question is, are the candidates the Republicans have been putting forward in these primaries, some of the more polarizing play-to-the-base candidates, are they going to be Kryptonite when it comes to independent voters and folks in the center? That's really where this battle is going to be won or lost." ROBERTS: Erick Erickson, speak to what John Avlon was talking to us about. Some of these candidates who are very far to the right, the one- many of the ones who are backed by the Tea Party- are they going to be Kryptonite come November? ROBERTS: Well, you heard a lot of that- maverick, maverick, maverick, maverick- 2002, his book, 'Worth the Fighting For,' said that it was the 'education of an American maverick.' But now, John McCain saying, 'I'm not a maverick. I never said I was a maverick.' (laughs) And Susan Molinari, I'm wondering how could he say that? AVLON: Yeah. No, that's just a dumb thing for him to have said, (Roberts laughs) and it's sort of indefensible, because it's such a core part of his identify, not just one imposed upon him, but one he accepted. And it's dumb, because this was- this was actually a great year for someone to stress their independence- for someone to stress- the John McCain who the American people have come to know and respect, somebody who was standing up against fiscal irresponsibility when Republicans were spending like drunken sailors. He stood up against his own party. That should be a message that's perfect for this year, and perfect for the Tea Party. The fact that he was independent should be a strength, but being primaried from the right, people kept saying that maverick was code for independent. So we've got to get some clarity right now. The Tea Party folks who say that the number one issue is spending- John McCain should be always a hero to them, and the fact that he's considered a RINO by some speaks to the sickness in our politics and a problem in the Republican Party right now. ROBERTS: One more quick comment from you, and then we've got to go to John King, Lisa. He doesn't really have to- if John McCain wins the primary, he doesn't have to worry about the general election. I think he won with 75 percent last time. CAPUTO: Likely not, but what he has to worry about is what's the public perception of John McCain? CAPUTO: What's his legacy? Which John McCain are we talking about? Are we talking about the maverick, or are we talking about the Reagan Republican? Who are we talking about? During two July 2009 appearances, Avlon picked "wingnuts of the week" from the right and the left, and was much more critical of his right-wing selections. He also labeled CPAC 2010's "saving freedom" theme as "a little extreme" during two segments on February 18 and 19.